Two years ago, a group of architects, artists and engineers announced plans to create a floating egg-shaped room to be occupied by artist Stephen Turner. Last month, the fruit of their labor was realized as the Exbury Egg, an energy-efficient, self-sustaining pod was launched in an estuary of the River Beaulieu in the UK. Turner will live in the egg for 12 months while he uses the space to study the life of a tidal creek and the ways in which humans interact with nature. The Exbury Egg is a collaboration between British design firm SPUD, Perring Architecture + Design (PAD), boat builder Paul Baker, naval architect Stephen Payne, and artist Stephen Turner. The egg is made from cold molded plywood and local timber, and it’s about 20 feet long and nine feet wide. Over the course of the 12 months that Turner will inhabit the pod, it will rise and fall with the flow of the estuary, floating on the water at high tide and resting on the mud at low tide. The interior of the egg is a simple space with a hammock, a small stove, a desk and a wet room. After Turner’s 12 month residency concludes, the Exbury Egg will become a traveling exhibition. Love this design. Very original. 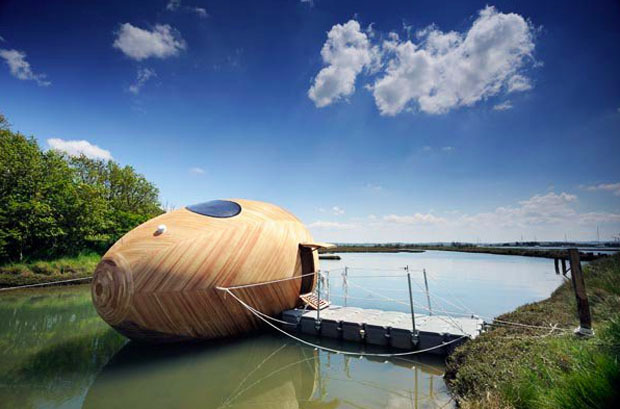 The Exbury Egg is a collaboration between British design firm SPUD, Perring Architecture + Design (PAD), boat builder Paul Baker, naval architect Stephen Payne, and artist Stephen Turner. The egg is made from cold molded plywood and local timber, and it's about 20 feet long and nine feet wide. Over the course of the 12 months that Turner will inhabit the pod, it will rise and fall with the flow of the estuary, floating on the water at high tide and resting on the mud at low tide. 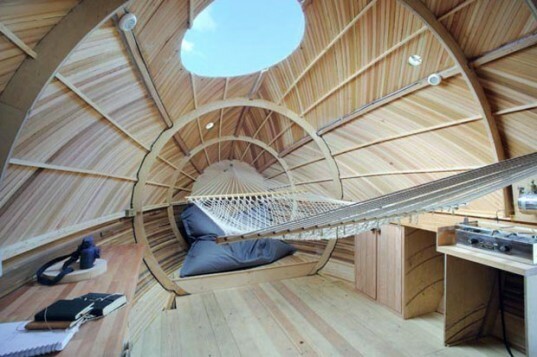 The interior of the egg is a simple space with a hammock, a small stove, a desk and a wet room. "Climate change is already creating new shorelines and habitats," explains Turner. "Established salt marsh is being eroded by a combination of rising sea levels and falling landmass and the entire littoral environment is in a state of flux. The implications for wildlife and for the flora as well as for people are challenging. Raising awareness of the past and the unfolding present of a very special location will be the task, whist living in an ethical relationship with nature and treading as lightly as possible upon the land." After Turner's 12 month residency concludes, the Exbury Egg will become a traveling exhibition.